Chitpur Road was Kolkata’s oldest road. It has existed for at least 400 years. It was known as Pilgrim Road and started from the North-end of the city stretched up to Kalighat Temple on Adi Ganga. Apart from the aristocracy, there have been common folks engaged in various trades. The distinctive Bengali panjika almanac and Battala books were brought out from this place. So many things on Chitpore Road have been an integral part of Bengal’s life and culture being the centre of supplies for jatra, magic shows and musical instruments, including English brass bands. It might have received its name from the goddess Chiteswari, who had a splendid temple here erected by Gobindram Mitter, or one Gobinda Ghosh, in 1610. At the temple, Chitey dakat, the notorious bandit of the region, offered human sacrifices. The area could also have acquired its name from him. The lofty dome of the temple, which was known as Nabarutna or the shrine of nine jewels, fell during the earthquake of 1737, and it is now in ruins. 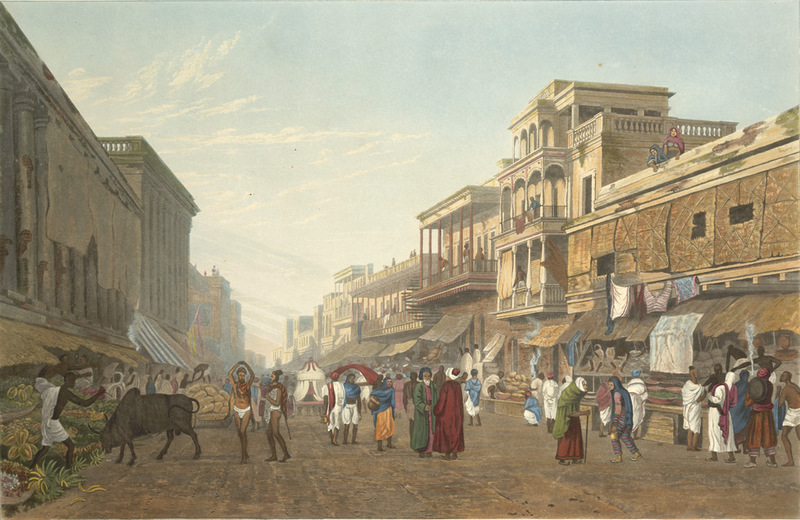 This entry was posted in Bazaars/Superstores, Bengaleese, Locales, Non-Bengali, Old Township, Roads/Bridges and tagged calcutta, calcutta streets, chitpur, James Baillie Fraser, markets, old calcutta, shops.